Open plan offices have their fair share of supporters and detractors. In a recent Harvard study, researchers are calling their efficacy into question. The report measured the impact the open workspace has on communication and collaboration. Several media outlets have seized on this, grandly describing this work as “the first study to empirically measure both face-to-face and electronic interaction before and after the adoption of open office architecture” and wondered if this marks the end of the open office. The study reminds us that nuance matters, especially in design. No two employees or companies are exactly alike. It’s a good idea to remind ourselves of these individualities before jumping to any conclusions. Gensler first entered this discussion a decade ago. Our 2016 U.S. 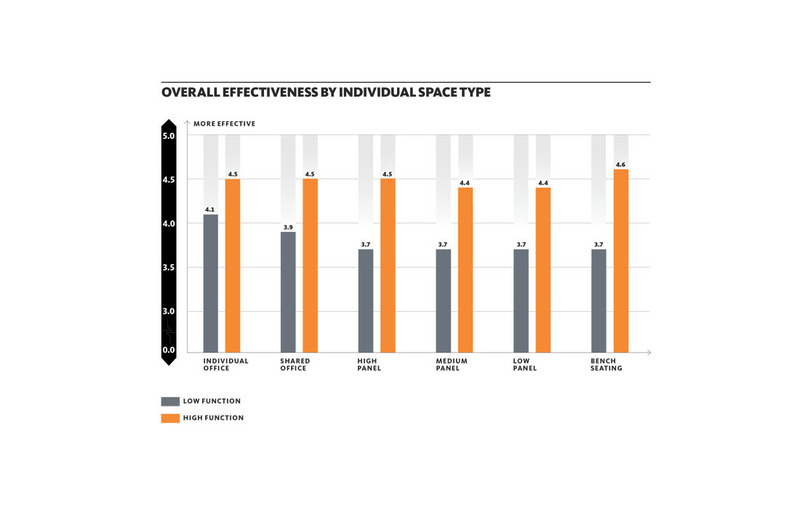 Workplace Survey compared the effectiveness of a wide spectrum of space types: individual offices; shared offices; high-, medium-, and low-panel open spaces; and bench seating. The results were striking. The degree of open or enclosed didn’t matter in high-performing work environments. If the space was designed to function well, all individual space types were rated as equally effective. An open plan can be just as effective as a private one. What matters is that design aligns with employees’ needs. Design: The design must be flexible because employees need choices. In fact, our Workplace Survey found that innovative companies offer their employees twice the amount of choices when and where to work than the less innovative counterparts. The ability to toggle back and forth between areas for collaboration and solo work makes an enormous difference. Noise Management: Offices that manage noise help employees feel like they are not being overheard by their peers. People stay engaged when quiet spaces are included in a layout. Bustle and energy can be great, but everyone needs a little solitude sometimes. Access: This may seem obvious, but the most productive employees need quick access to people and resources. From food to supplies, it’s important to include resources that are easily found so that people feel connected and well-supplied for success. Access to teams, decision-makers, and subject matter expertise is paramount to moving work quickly forward in business today. Yet, communication is a constantly changing challenge. People are more connected to their devices than ever before. This issue follows us to work as well. Thoughtful design provides the right balance between collaborative and solo spaces so employees don’t feel overwhelmed or self-conscious. Several lessons from our 2016 U.S. Workplace Survey bolster this perspective. First, most innovative companies tend to foster collaboration in places other than primary workspaces. Of those, 70 percent featured in-person collaboration in conference rooms, as opposed to only 60 percent of the least innovative set. Likewise, 44 percent of the most innovative companies collaborated in open meeting areas, compared to only 26 percent of the least innovative. Again, innovators toggle back and forth between collaboration and solo work and make effective use of all kinds of spaces and places. Lastly, only 17 percent of non-innovators report having choice in when and where to work. This is a pitfall for both open office plans and private offices: if an employee feels like they have no control, performance will suffer regardless of layout. We live in an age of metrics. It makes sense to measure the success of a workplace by how much its employees communicate, but this metric alone is not enough. The workplace depends on many factors. When you have a well-designed space that works for both focus and collaboration, these pieces tend to fall far more easily into place. The open office is not dead, but a high-performing workspace is more than just an open plan. is a Principal in Gensler’s Washington, D.C., office. 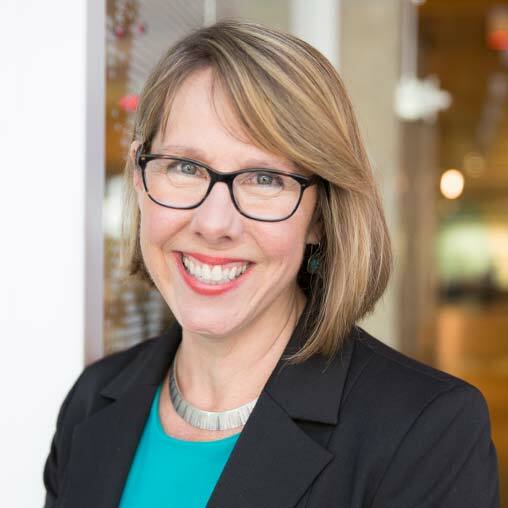 She co-leads the firm’s Workplace Sector and is a frequent writer and speaker on the critical issues affecting the design of high performing work environments. Contact her at .